In a recent grower visit in southwest Indiana, we saw a severe root-knot nematode infestation on high tunnel tomatoes. Soil fumigation is by far the most effective approach to control nematodes, but many soil fumigants are not labeled for greenhouse (high tunnel) use. In addition, the types of equipment that used for soil fumigation are often hard to fit into high tunnels. Considering the constraints, this article focuses on cultural practices to control root-knot nematodes that can be easily adopted by small-scale, high tunnel growers. Root-knot nematodes are small, colorless roundworms that dwell in the soil. They penetrate into plant root in the juvenile stage. Once they find a favorable location in plant tissues, they stop moving. Infested root cells start swelling and form galls that are the characteristic symptom of root-knot nematode infestation (Figure 1.). Infested roots fail to absorb water and nutrient resulting in stunted growth, yellowing and wilt of above ground plants. Going through their life cycles, mature females lay eggs on root surfaces. Figure 1. Galling of tomato roots infested by root-knot nematode. Root-knot nematode thrives best in well aerated, moderately dry soils; it is a problem in regions where winter is not harsh enough to kill root-knot nematode eggs. It causes damage on melons in southern Indiana but generally is not a major pest for vegetable production in other parts of the state. High tunnels can extend the crop production season. However, high tunnels also creates a more favorable environmental condition for pests like root-knot nematode. As a result, root-knot nematode can potentially cause damage to high tunnel grown vegetables everywhere in Indiana. Movement of root-knot nematode in soils is extremely slow, it is unlikely that root-knot nematodes move into the high tunnels by themselves. But contaminated tools and plant materials, feet of human and other animals are more likely to bring root-knot nematode into high tunnels. Once soils are contaminated, root-knot nematode populations increase quickly with the presence of host plants, and favorable soil conditions, i.e. warmth, moisture, and oxygen. Good cultural practices can effectively prevent or reduce damage caused by root-knot nematode. The first step is to prevent soil contamination. Carefully clean and sanitize any tools used in high tunnels after being used in the open-field, including trackers, shovels etc. Use ground covers to cover exposed soils in high tunnels. Do not allow plants to stand in the high tunnel for a long period after the final harvest; destroy plants immediately. The preferred approach is to remove plants completely and expose the roots to the drying action of wind and sun. Keep high tunnels free of weeds as many species are also hosts of root-knot nematode. Soil solarization can help clean the soil. It should be routinely practiced in the summer when it is possible. In vivo studies found root-knot nematode eggs and juvenile can be killed in 14 hours at temperatures of 108 ºF and above. This exposure time can generally be obtained within a six-week period of solarization during summer in a high tunnel. However, soil solarization is less likely to completely eliminate root-knot nematode population in the soil. Root-knot nematode may be recovered at the end of the following cropping season if susceptible crops are planted. This is because roots of the host plant attract nematode that survive in the lower soil profile at where temperatures during soil solarization did not reach the lethal level. However, crop damage normally is much lower in soils with low nematode population than that of high population. Dry fallowing and cultivation to bring as much soil as possible to the surface are effective in killing root-knot nematode through starvation and desiccation. It is very important to keep the field or high tunnel weed-free during fallowing. Dry fallowing and tillage, however, are destructive to soil fertility. Composts and other organic materials should be added to the soil following fallowing to restore soil fertility. Using crop rotation to control root-knot nematode is difficult in high tunnels because of the limited and valuable spacing. Vegetables commonly grown in high tunnels (tomato, cucumber, pepper, lettuce, spinach, carrot etc.) are hosts of root-knot nematode. It might be possible to plant a non-host winter cover crop to help managing root-knot nematodes, examples include rye and wheat. Be cautious that some of the cool season legume cover crops such as hairy vetch and crimson clover are also hosts of root-knot nematode; they may encourage populations of root-knot nematode under high soil temperatures. Various Brassica species that can release toxic compounds after breakdown have nematicidal effects. 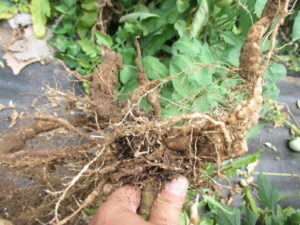 However, results of growing cover crops as biofumigant to control root-knot nematode is mixed because these crops may be hosts of root-knot nematode, resulting in a population increase during cover crop cultivation when conditions are favorable. Tomato varieties with resistance to root-knot nematode are available. The resistant tomato varieties contain a single dominant resistant gene. Nematode fails to develop and reproduce normally within root tissues of a resistant variety. However, under high root-knot nematode populations, crop yield loss may still occur even though resistant plants develop less galling. Studies conducted in Florida indicated that the resistant gene is sensitive to high temperatures, it may lose resistance when temperatures are above 78 °F. Another concern of using resistant variety is that they may not have required market characteristics such as flavor, yield, fruit type etc. In this scenario, grafting market-acceptable but nematode susceptible varieties onto nematode-resistant rootstocks has shown great promising in controlling root-knot nematode on tomatoes. Moreover, most commercial tomato rootstocks have vigorous root systems that may improve crop yield even without the presence of root-knot nematode pressure. 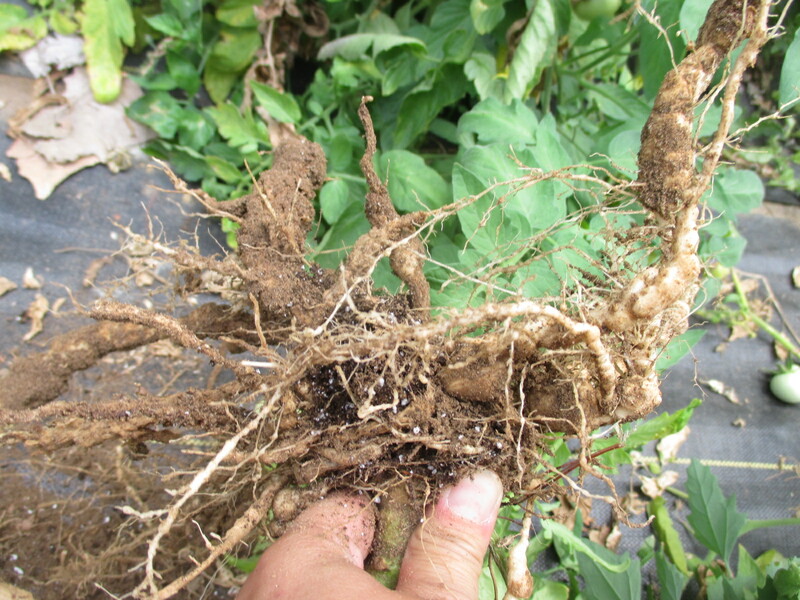 A new nonfumigant nematicide Nimitz® (active ingredient Fluensulfone) has shown promise in controlling root-knot nematode. The product has a unique but unknown mode of action. It is a soluble compound and moves through the soil water. Studies have shown that drip application of Fluensulfone reduced the number of root-knot nematodes and galls on tomatoes. However, this product has limited residue activity, only works when nematodes are active. Its label is silent on greenhouse use. It is not likely that any of the approaches can completely eliminate root-knot nematode population in the soil. Whenever it is possible, using a combination of the practices to reduce root-knot nematode population in the soil, and reduce crop damage to the greatest extent.